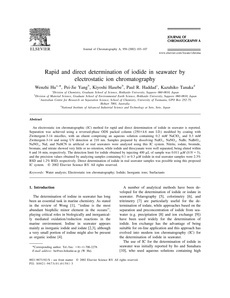 An electrostatic ion chromatographic (IC) method for rapid and direct determination of iodide in seawater is reported. Separation was achieved using a reversed-phase ODS packed column (250�6 mm I.D.) modified by coating with Zwittergent-3-14 micelles, with an eluent comprising an aqueous solution containing 0.2 mM NaClO4 and 0.3 mM Zwittergent-3-14 and using UV detection at 210 nm. Samples prepared by dissolving NaIO3, NaNO2, NaBr, NaBrO3, NaNO3, NaI, and NaSCN in artificial or real seawaters were analyzed using this IC system. Nitrite, iodate, bromide, bromate, and nitrate showed very little or no retention, while iodide and thiocyanate were well separated, being eluted within 6 and 16 min, respectively. The detection limit for iodide obtained by injecting 400 μL of sample was 0.011 μM (S/N=3), and the precision values obtained by analyzing samples containing 0.1 or 0.3 μM iodide in real seawater samples were 2.3% RSD and 1.2% RSD, respectively. Direct determination of iodide in real seawater samples was possible using this proposed IC system.